Have an application where we have one CAT6 going to a location where the client wants a PTZ but the PTZ we want to use is not PoE+. The PTZ runs off 24vAC and about 20 watts. Is there any converter available that would allow you to convert a non-PoE+ PTZ to PoE+? 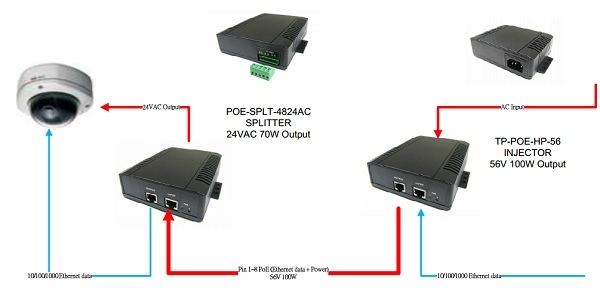 What you need is a PoE injector and splitter that will convert the DC PoE or PoE+ power to 24VAC power. Tycon Power Active PoE Splitters AC & DC Output, will go up to 70W at 24VAC. Here are a few online suppliers. The 24VAC splitter goes near the camera. The high PoE or PoE+ injector near the network switch. Vivotek 24VAC PoE injector/Splitter, I cannot tell the wattage from the web page and can't find that unit on Vivotek's site. These units are not weather-proof, they will need to be installed in appropriate junction boxes if mounted outdoors. If you need to extend the POE or POE+ over CAT6 to longer distances consider Veracity PoE extender.